Saraswati Yantra For Knowledge, Education, Intelligence & Creativity. This is made on copper plate and worship is offered with white cloths, white lotus flowers and white coloured estables are offered. By constant worship of it one becomes learned, famous and praise from all. This is a famous yantra well known and needs no further explanation. Knowlege is power. Everybody needs enhance their knowlege throgh various ways like academic pursuits, private studey of religious/ spiritual treatises etc. From Vedic times, Goddes Saraswati is regard as the giver of wisdom. She is also referred as Vak devi(goddess of speech) and Sakala kaladhishtatri(goddesss bestowing alll the art forms.) One of the Trantric means is the worship of yatras. Different geometrical form are recommended for different purposes. 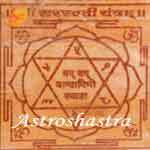 Carefully prepared Yantra, if propitiated with ardent devotion can definitely enhance the knowledge of the devotee. By worshipping it students will perfrom well in the examinations. Concentration and memory power will increase. Only good thoughts willl springup form their minds. 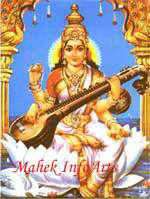 For acquiring spiritual wisdom also, the grace of Goddess Saraswati very essential. Its worship is very simple. It can be kept in the pooja room cupboard. Pooja should be performed in the eraly morning after taking bath. Apply sandal paste and kumkum to it. Light deepam and offer white flowers . Recite the following sloka as many times as possible for best reults.